Crowns, wands, and a special visit from The Little Mermaid herself, made this week especially magical! Movement Monday included a long visit to the playground where in addition to our playground structures, campers played with beach balls and hula hoops. 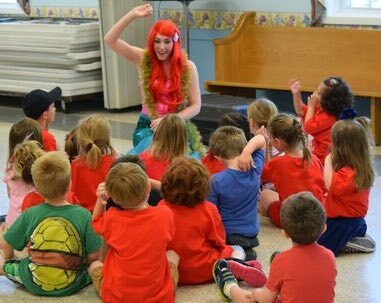 Our campers enjoyed Ariel’s visit, which included singing, dancing, games, an underwater treasure hunt, and fishy-tattoos. We had absolutely beautiful weather for Wet and Wacky Wednesday and the campers jumped through the sprinkler, filled squirt toys, blew bubbles, traced each other with sidewalk chalk, and enjoyed ice pops on the gazebo lawn. They really got a kick out of the “Water Machine” – a water jug with a push-button spout! 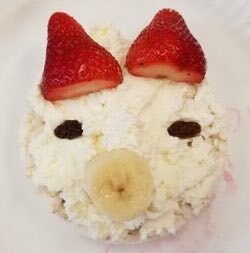 Thursday’s story was The Three Little Pigs and campers created an art project with three different houses, built with Lincoln Logs, experimented with how much force they needed to use when blowing through a straw to knock over different objects, acted out the story, and created Rice Cake Piggies.